Joseph James Barrett Powney was born in Yeovil in 1887, youngest of the eight children (half of whom died in infancy) of grocer William Henry Powney (1846-1924) and Ann Elizabeth née Barrett (1849-1932). William and Ann's children were Benjamin John (1870-1878), George Barrett (1872-1941), Annie Jessie (1873-1874), Florence (1878-1878), Beatrice Ellen (1881-1881), William Benjamin (1882-1955), Agnes Jessie (1884-1977) and Joseph. In the 1901 census William, Ann and Joseph were listed living above William's grocery shop at 96 Middle Street. 14-year old Joseph gave his occupation as a clerk in a merchant's office - this was, in fact, the clerical office of Aplin & Barrett where he continued to work until the time of his enlistment. The family later moved to Grove Avenue. Joseph enlisted at Bridport during 1915, joining 'C' Battery, 217th (3rd Wessex) Brigade, Royal Field Artillery as a Gunner. His Service Number was 860608. The 217th (3rd Wessex) Brigade, Royal Field Artillery served as Divisional Artillery with the Wessex Division which was part of the Territorial Force. Just before war broke out in August 1914 the units of the Division gathered on Salisbury Plain for their annual summer camp and ordered for precautionary measures to be taken. On 3 August 1914 they broke camp and moved to take up defensive positions at the ports. The division was mobilised for full time war service on 5 August and by 10 August had returned to Salisbury Plain to prepare for service overseas. The Wessex Division was ordered to India to replace British and Indian regular army units who were to be deployed to the Western Front. They sailed from Southampton on 19 October 1914, via Malta and Suez, arriving at Bombay on 9 November 1914 and remaining in India through out the conflict. Joseph would have joined his unit in India after his basic training in England. The problem for troops stationed in the Indian sub-continent was not the danger of enemy action, but rather suffering the effects of heat and disease. At the beginning of July 1918 Joseph was hospitalised in the Lahore Cantonment, suffering from heat stroke. He died on 6 July 1918 aged 32. The Western Gazette, in its edition of 12 July 1918, and clearly unaware that Joseph had died the previous week, reported "Gunner J Powney, R.F.A., son of Mr and Mrs Powney, Grove Avenue, is reported to be lying seriously ill in hospital in India, suffering from heat stroke. Before joining up three years ago, he was a member of Messrs. Aplin & Barrett’s clerical staff." Joseph's will was proved in London on 10 February 1919 and his effects valued at £466 2s 4d (around £20,000 at today's value). 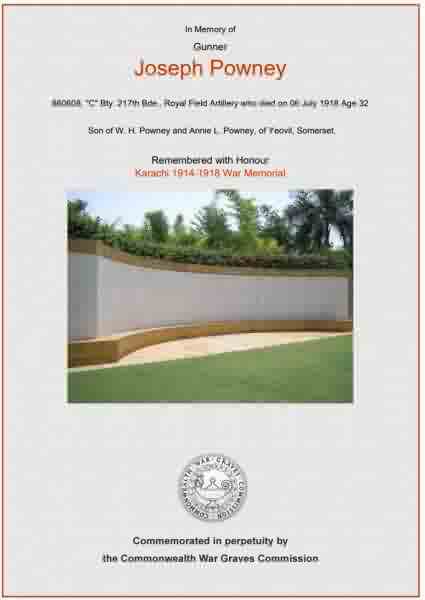 Joseph Powney's name is recorded on the Karachi 1914-1918 War Memorial and is also recorded on the War Memorial in the Borough. The Commonwealth War Graves Commission certificate commemorating Joseph Powney.